Summer is in full swing and that means the weather is just going to get hotter for a few more weeks. While it may seem like a great reason to spend time indoors, seeking comfort from your air conditioner, it’s unlikely that your kids will agree. They want to be outside, enjoying the sun and the freedom that summer brings. Your Denver sprinkler installation pros want to help you come up with creative ways to keep the kids entertained and cool outside this summer. Here are a few fun activities to try before the school year starts up. 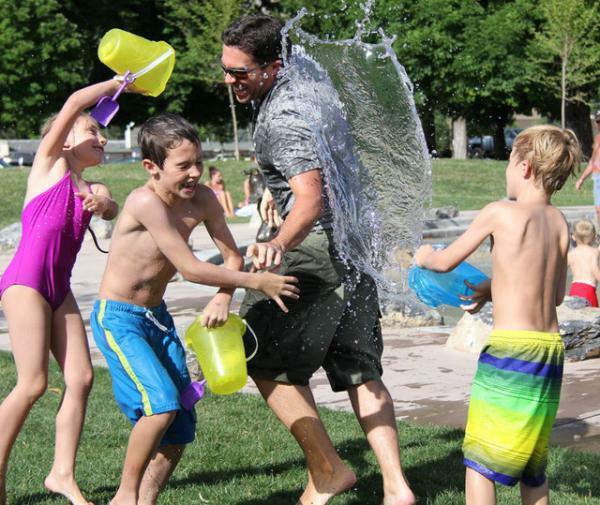 Nothing burns off energy while helping kids stay cool like a good old-fashioned water gun fight. Pick up a few water pistols from the dollar store and let your kids go at it! This is especially great for siblings that are often overly competitive. There’s no clear winner—it’s all about having fun and getting soaked. To make the event even more exciting, get other kids from the neighborhood involved! Set up water refill stations throughout the yard. Fill several buckets with water and place them along the perimeter where they won’t get knocked over by running feet. All the kids need to do to refill the pistols is remove the plug and dunk the pistol in the bucket. This can mean hours of fun with little to no cleanup afterwards! Water balloons may be a great way to stay cool, but they’re incredibly messy and can pose a hazard for your landscaping, pets, and even your sprinkler system. Instead of tossing water balloons in the yard and having to painstakingly clean up small bits of rubber, use sponges! The bigger the sponge, the more water it will hold and the more soaked you’ll get. Set out buckets filled with water and soak the sponges. Large sponges can easily be tossed back and forth like a football, keeping kids and their friends active while helping them cool off. However, if you have smaller children or want to enjoy a more traditional water balloon-like experience, use smaller sponges. Here’s a great tutorial on how to make reusable sponge water bombs to completely replace those disposable water balloons. Nothing beats the thrill of sliding across a long stretch of yard while getting soaked, but many of the commercially available slip and slide kits are expensive, putting a strain on your summer fun budget. Instead of buying a kit, make your own slip and slide. All you need is a large tarp, a water source, and a place to spread out. Lay the tarp on the lawn close to, but not on top of the sprinkler heads in the yard. Then, drench the tarp with water from the garden hose and let your kids slip and slide across the surface. For added fun and speed, grab a few pool floats and use them as water sleds. These will allow your kids to skim across the surface of the tarp quickly while also softening the impact as they jump. If you’ve laid out the tarp properly, you should be able to use the sprinklers to add to the experience, watering your lawn and drenching the kids in the process. Now that you already have the slip and slide set up, make it even more fun by creating a wet and wild bowling alley in the backyard. Start collecting two-liter soda bottles—you’ll want ten of them—and wash them thoroughly. Fill them about ¼ full with water to ensure they stay upright while your kids slip down the slide. Be careful not to put too much water in them as it will make the impact painful, especially for younger kids. Arrange the soda bottles in the traditional bowling pin triangle. Wet the tarp thoroughly with the hose and let your kids slide down the length to crash into the bottles. If they’re playing with other kids, let them keep score with sidewalk chalk. This way, the mess will be easy to clean up afterwards and they won’t have to worry about soggy paper getting in the way of their score-tracking efforts. Kickball is a great game for kids of all ages, but running in the summer heat can be tough, especially if they’re playing in a yard with minimal shade. Instead of setting out traditional bases, use kiddie pools where kids can get a good splash in while they wait for their teammates to kick the ball. Consider using soft-sided inflatable pools so those used to sliding into the bases won’t injure themselves. If you’re looking for a way to entertain a large group of kids, encourage them to play a game of duck duck goose. However, instead of simply tagging the “goose,” players will get dunked. Fill a small bucket with water and give it to the first player. As they go around the circle, they’ll need to pick their “goose.” Once they do, they’ll dump the bucket of water over them and proceed to race around the circle. The game can go on as long as the group wants, but the added surprise of getting dunked makes the game interesting even for older kids. Nothing beats running through sprinklers on a hot day. The gentle mist is enough to get you soaked if you’re playing directly in the spray or cool you off if you’re just on the outskirts. When turning on the sprinkler system for your kids, explain to them the importance of not touching the sprinkler head itself and encourage them to leap over the middle of the spray so they avoid stubbing their toes on the metal. This will keep your sprinklers in good shape for the entire summer and keep your kids from spending the summer nursing cuts and bruises from the sprinkler heads. Before school starts up, let your kids have fun in the sun. Let the experts at Water Solutions Sprinkler Service make sure your sprinkler system is up to the task. Schedule an inspection and maintenance appointment today and enjoy summer to its fullest.